Asking yourself what the heck is Fritorole right now? Good. Because it’s a word I made up. But it’s what it sounds like – a Fritos casserole. Yes that means a casserole that involves using an entire bag of Fritos in the ingredients. Legit? Very. 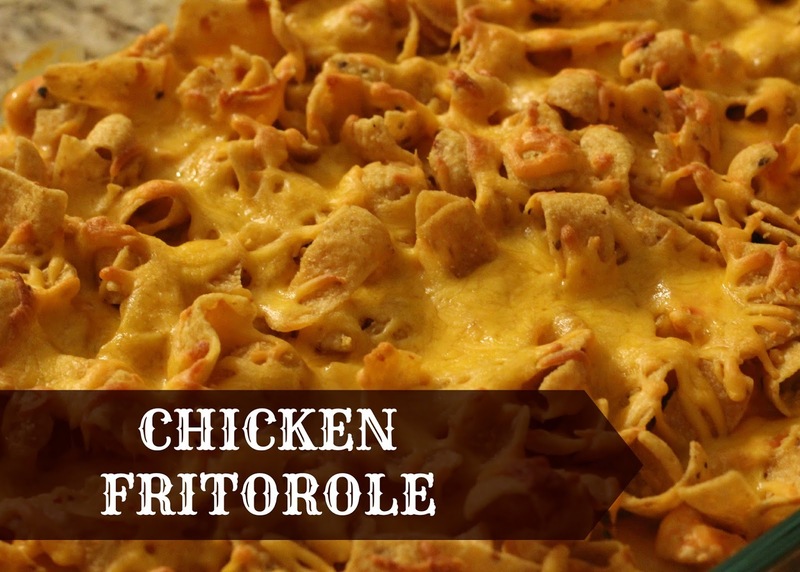 I got the idea for the Chicken Fritorole from recipes for chili casseroles using Fritos. I don’t care too much for chili, but love a good chicken casserole, and love Fritos, so I decided to see what I could come up with. For the record I am writing this up immediately after I made the Fritorole for dinner, because it is that good that I feel the need to share it with the world. So run to the store, grab what you need, and make it for dinner tonight. And share it with your significant other, and they will love you a little more for it. 1. Preheat oven to 350 degrees. In a greased pan lay enough Fritos to cover the bottom of the pan, about half if you are using a cake pan. Cover those Fritos in half of the cheese. 2, Season your chicken as desired, I used some dry onion, grilled chicken seasoning, and salt. Cook in a large sauté pan until cooked all the way through. Add tomato sauce and cream of chicken soup and stir well. Keep over medium-low heat for a few minutes, stirring occasionally. 3. Remove from heat and add sour cream, mixing well. Pour over Fritos and cheese in pan. Top with remaining Fritos and cheese. 4. Cook in oven until brown on top, around 20 minutes. Allow to cool before serving. Enjoy! looks so yummy and comforting! this would be a huge hit to make with leftover turkey the day after thanksgiving! YES it would work great with Turkey! This dish totally reminds me of a dish my mom used to make called Pedro's Special! Yummy! This is probably one of the most amazing creations of food I've seen in a long time! That's a must try! It's pretty tasty! Go for it! This definitely looks like a home cooked dish that a lot of wives and mothers can easily make. Glad that recipe was easy to make. Very unhealthy haha but I figured the low fat sour cream and using chicken instead of beef made it okay, right? Will try making this chicken recipe later. This looks So delicious! Pinning for later! Oh man that looks and sounds so delicious! I am lactose intolerant and it is torture when something looks so yummy. omg fritos in a dinner casserole?? YES PLEASE! OMG that looks both unhealthy and incredibly, incredibly delicious! It IS both! I figured using chicken instead of beef and the low fat sour cream counted for something? Maybe? Sometimes I wish I wasn't paleo because that looks so good! I love easy recipes because I'm not much of a cook. Fritos are my fav! I can't wait to make this! Thanks! I love the name Fritorole, and I like the fact that you made it up even more! Looks like a delicious dish and cosy dish! This sounds delicious. I used to eat Frito's all the time ! This looks great. I don't like Fritos for some reason, although I want to like it. But the cheese on this might make me want to try and like it.